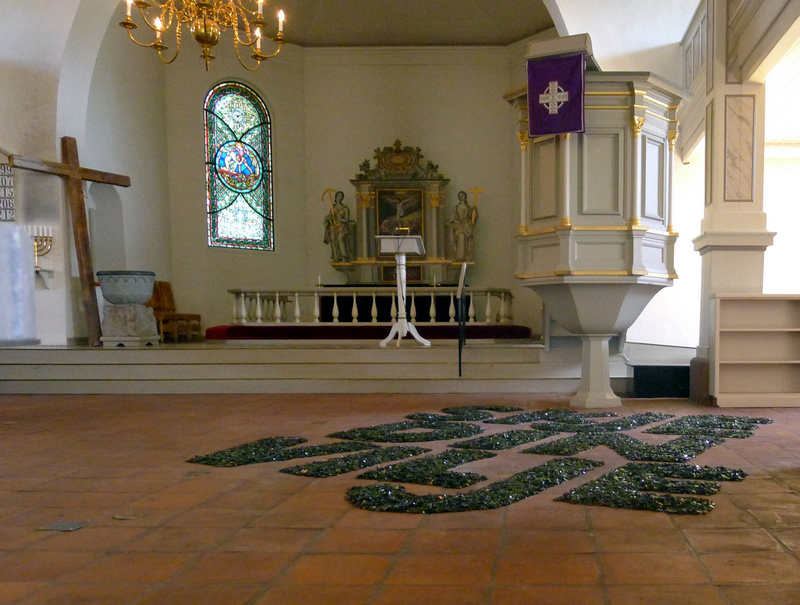 Part I of the installation that was produced in Nøtterøy parish church (county Vestfold, Norway) during Easter 2014, takes its point of departure in a section of the basic prayer within Christian tradition, the Lord’s Prayer, with the words ’Thy will be done’. 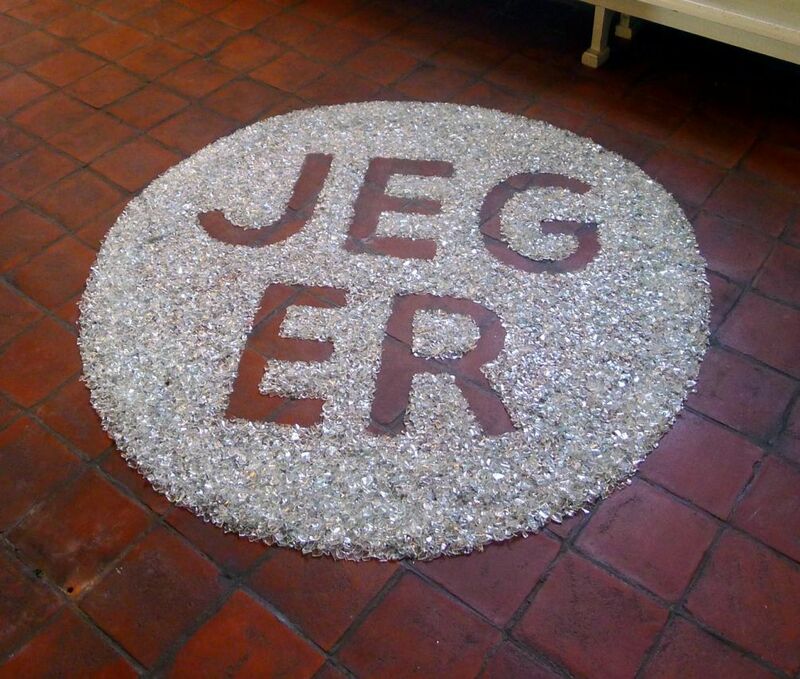 The artistic expression was made of big letters written on the floor under the pulpit in broken glass from wine bottles. Since 1985 the Easter mystery has been at the core of my artistic practice. I have experimented with formal expressions of the cross and the crucifix in order to dig into and understand the narratives of the passion of Christ, his suffering, death – and resurrection. When I began this work, my preconception of Easter was uneasy. Mentally I was stuck in the nightmare of Good Friday, unable to move on to Easter Morning. In my mother tongue Good Friday is called Long Friday (Norwegian: Langfredag). When I realized the English name of this endless, bad day, I was at first confused. How could such a day be called a good day? How could a day of torture and suffering be denoted positively? During many years I pondered this. a) Jesus was killed because he held on to his ideas, denying to resign them. According to the evangelical narrative he had many chances to get away and survive, but he actually kept saying things which he knew would bring him to the cross (for instance during the interrogation by Pontius Pilate). He also refused to run off in the garden of Gethsemane. b) After the death on the cross something happened. In this respect one may say that the resurrection is an effect. The death on the cross symbolizes that death is not final, but the very beginning of something new and different. The resurrection is a starting point for the Church, Ecclesia, (from Greek: the community of the people of God, the believers). At this stage I was ready to move on in my artistic practice and look at the life of the Church and myself as being part of the Ecclesia. Praise: For the kingdom, the power and the glory are yours. Now and forever. To think that prayer can manipulate God and influence the future the way I wish is superstitious magic. Many have experienced that prayers do not work. Regardless of how much one prays, ill fortune and disasters happen all the same. Disappointed they may turn their back on faith and religion. However, this is not the way prayer is taught within the Christian tradition. From a theological perspective the only secure thing to say about prayer is that it affects the one who prays. And in the Christian tradition one thinks that prayer affects those who are prayed for. The mature religious attitude to prayer is that one prays in order to change and dispose oneself so as to receive properly what God has willed for us. And through this change in attitude the person who prays becomes better able to cope with the way things go in the world. Such an attitude is expressed in Lord’s Prayer in the section ’Thy will be done’. Prayer understood in this way actually may represent a survival strategy. In this perspective, the prayer section ’Your will be done’ is the central section in the Lord’s Prayer. Not only is it placed in the middle of the prayer text, it is in itself the very core. The old Norwegian version (1744) was: Skje din vilje (English: happen your will). This is quite a scary saying. To acknowledge openly: I am not in control, only God is. And furthermore: the prayer explicitly expresses that ’your’ will – not mine – decides. Your will be done, in consequence, deals with surrendering to that which is going to happen, accepting whatever may come. It represents an acceptance of what has been given to you, without being able to change or direct destiny yourself. How can the Easter narrative be expressed anno 2014 and specificalliy in Nøtterøy church – a church that was originally built in the early 12th century and consecrated to Holy Mary? After the Reformation (1536) the cult of Mary was discontinued, all images, sculptures and probably a side altar devoted to her were removed. The Lutheran tradition is characterized by its strong emphasis on the Word (the biblical texts). Personally I regard the so-called catechism tablets from Scandinavia in the after-reformation period especially beautiful and still meaningful for our time. These tablets, covered by calligraphy or a tight handwriting, replaced the former altarpieces. 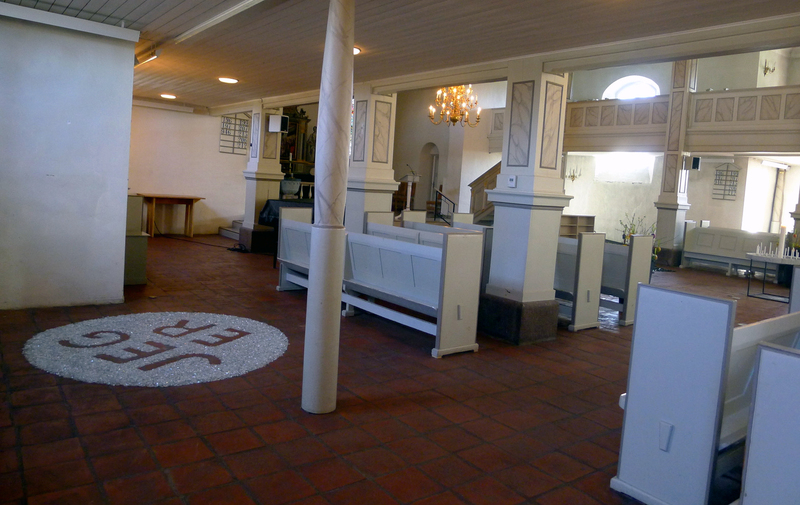 This is the tradition I find it natural to affiliate with in a space like that of Nøtterøy church. The question, however, was what to write. Since Jesus died around the year 30, this text is written ca. 20 years after the factual event. Paul never met Jesus. Still, it is astonishing how little he has to tell – especially seen in relation to how verbose he usually is in his letters! In this matter, however, he carefully restricts himself, saying ’in accordance with the Scriptures’. He presents this reference in relation to that has happened concerning the death of Jesus and repeats it when he refers to the resurrection. But when he tells about the death and burial he is confident, just stating: he was buried. St. Paul believes ’in accordance with the Scriptures’ (Latin, secundum scripturas) like the expression in the Nicene creed from the early 4th century. The conclusion in the prayer of Jesus is: let it be as you, not I, would have it, which in effect contains the same message as the prayer section of Lord’s Prayer: thy will be done. This is what Jesus – according to the evangelists – prays, and this is what becomes the continuation of the story. The Easter installation is a site specific work that was produced in two separate stages. The shortest form of the actual section of Lord’s Prayer in Norwegian is the old translation Skje din vilje. I have chosen to use this version for two reasons. First, because this is the saying I was taught as a child, and secondly because this expression is more compact in letters tha newer versions and more interesting as an calligraphic form. Otherwise I have no objection to newer translations that may be more exact in comparison with the original Greek formulation. 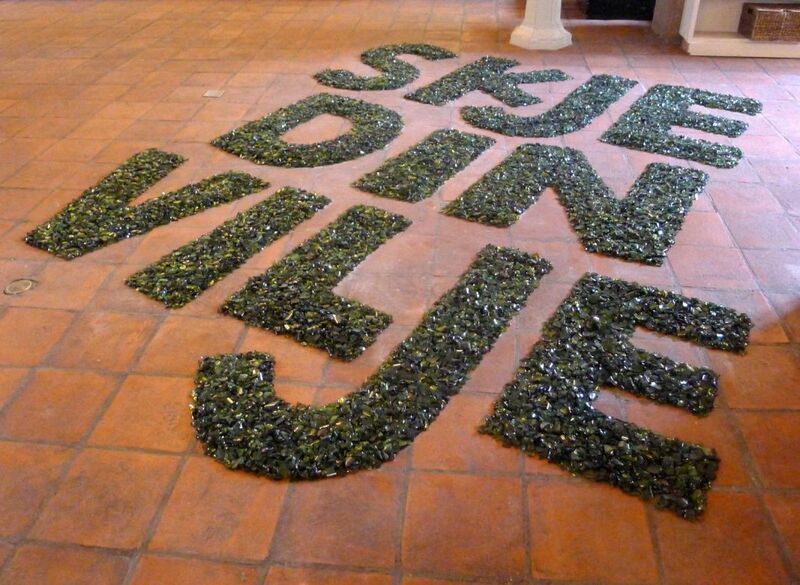 Part I, Skje din vilje, was written before Palm Sunday. 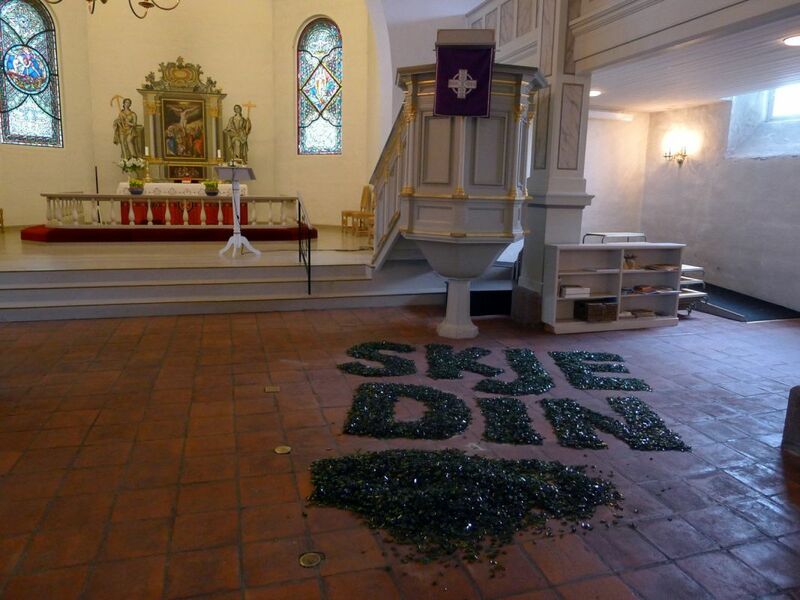 The material is broken wine bottles, a substantial part of which are altar wine bottles from the Cathedral of Oslo. Part II, I Am, was to be laid on Saturday, the evening before Easter. Information about this part was available at the time of its actualization. 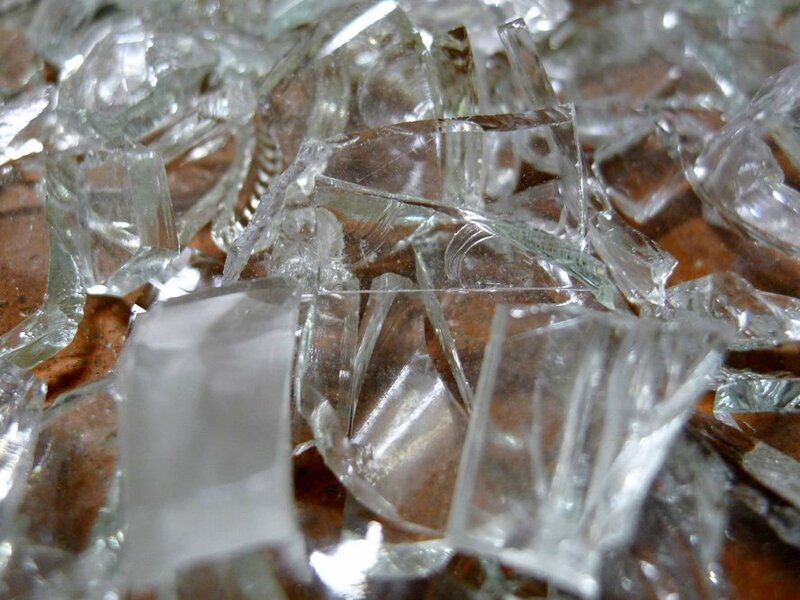 The congregation collected transparent recycled glass during Lent (40 days before Palm Sunday) that was to be used for the work. The work was shown until the second Sunday of Easter and the event was closed by an artist’s talk and conversation between the artist and the visitors within the church room. Part II takes its point of departure in the oldest definition of the concept of God in the Bible, where God is revealed to Moses and says: ’I am who I am.’ The letters stands out as absence of material. Today, many people regard Christian dogmas and words about God incomprehensible and irrelevant. That is not strange since the Biblical texts are 2-3000 years old, written in a culture and under conditions that are far from today’s world and understandings. But this oldest concept of of God I personally find attractive and interesting. Therefore I have chosen it as an expression of the resurrection. - Part I is made of broken green glass that I brought with me, while Part II is made of broken transparent, recycled glass that has been collected by the congregation during Lent. - The letters in Part I are composed in glass, while the letters in Part II stands out as absence of material. - Part I is laid openly in the nave, while Part II is hidden in the Northern wing of the church room. - The letters in Part I are turned away from the pulpit towards the congregation, while the letters in Part II are turned to the priest on the pulpit. Grete Refsum is a professional visual artist and artistic researcher, educated in Oslo National College of the Arts, Diploma in stained glass (1985) and Hovedfag (Master equivalent) in colour/form (1992). She holds a dr. ing. (PhD equivalent) from Oslo School of Architechture (2000) in the topic of ecclesial art. In 25 years, Refsum has worked on religion and existential topics as the theme of her art and art development work (artistic research). Taking her point of departure in the Western Christian tradition, she has explored the cross as symbol, liturgy and prayer or meditation. Her goal is to create visual expressions that offer new interpretations, which may contribute to reflect contemporary religiosity and spiritual needs. The intention is raise that which seems relevant today and pass it on to new generations. During the last years, Refsum has experimented with relational art projects in ecclesial spaces, in which the congregation and the visitors have been involved as participants. Her artistic expression is generally abstract, geometric or symbolic so that it open for dialogue between faith and non-belief, ecumenic between various Christian deniominations, and inter-religious between different religions. For more information and complete curriculum vita, see: www.refsum.no. This text is written catechetically (from Greek catechesis, oral teaching) in order to be informative for everyone regardless ofpreconception. Pictures are available here: http://gallery.refsum.no/#!album-5. Luke chapter 11, verse 1(The Jerusalem Bible, see: http://www.catholic.org/bible/book.php?id=49&bible_chapter=11). Mathew chapter 6, verses 9-14 (The Jerusalem Bible, see: http://www.catholic.org/bible/book.php?id=47&bible_chapter=6). See: Brümmer, Vincent. 2008. What are We Doing When We Pray? On Prayer and the Nature of Faith. Hampshire, UK: Ashgate. Original edition 1984, pages: 12-13. 1. Corinthians, chapter 15, verses 3-5 (see: http://www.catholic.org/bible/book.php?id=53&bible_chapter=15). Marc 14:36 (see: http://www.catholic.org/bible/book.php?id=48&bible_chapter=14); see also Matthew (26:39) and Luke (22:42).